Calling all Volunteers and Potential Volunteers!! Do you know how the Wharton Club operates? Would you like to be involved? Here's your chance to find out. You might find something that you would like to work on, possibly meet a former classmate, learn something new... What's your enlightened self-interest in being involved in the Club? The Wharton Club Volunteer Orientation Night is a great opportunity to hear from Club President, Regina Jaslow and members of the Club's management team about plans for the upcoming year. It could change your life! The next Wharton Club Volunteer Orientation Night is Tuesday, November 14, 2017 @ 7:00 PM. There are many volunteer opportunities available and they can be designed to fit your needs, so please come and hear about our Club and how you can help make it even more effective. 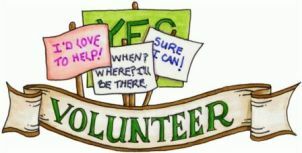 For a complete list of Volunteer Opportunities click here. Registration is subject to availability and will close on Monday, November 13 at 4:00pm - No Exceptions!